Click here to read the Brunswick Real Estate News. In case you missed it, click to read the June (part 2) 2018 edition of the Brunswick Real Estate News! On the cover, you'll read about why you should choose to buy now! On page two find out about cool events happening this summer in the Brunswick area. In addition, you'll also find some great travel and decorating articles, as well as a delicious recipe from Wolfgang Puck. We hope you enjoy reading our paper as much as we've enjoyed publishing it. 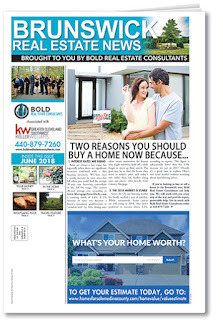 Let us know your thoughts, and don't forget to check out our listings on the back page! Thanks, Brunswick!